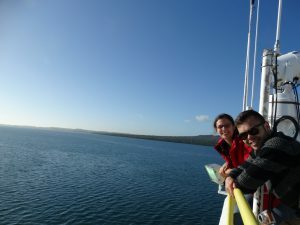 I am currently writing this blog post after my first week aboard the JOIDES Resolution. Before this adventure, I had never been at sea for more than 2 hours (!! 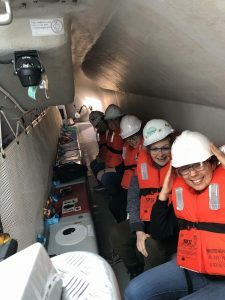 ), so I have been learning a lot about life as a scientist onboard a research vessel. 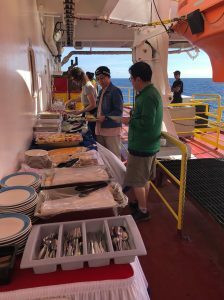 An enormous BBQ-buffet on the front deck of the JOIDES Resolution. 1. Everybody on board works 12-hour shifts. Most scientists work from 12-12 (midday to midnight, or midnight to midday). There is always somebody onboard working, and there is always somebody onboard sleeping! This first week has been a bit tricky, as I have ship lag (as opposed to jet lag). I have been trying to get used to waking up at 10.30 pm and going to sleep at 3 pm! 2. The galley (kitchen) serves wonderful food at all hours of the day! My favourite meal of the week had to be the outdoor BBQ – the sun was out, the sea was flat, the wind was calm – and we had a super-tasty BBQ in the middle of the ocean!! The JOIDES Resolution has a baker onboard, so one of the highlights of being on the night shift is that we get to eat warm freshly baked cakes for “morning tea” at 3 am! This week I had a banana cake with nuts and chocolate chips that were still melty… YUM!! THIS IS A DRILL! THIS IS A DRILL! Testing out Lifeboat #1 during an abandon ship drill. 3. Lifeboats sure are crowded on the inside! Dr Dominique (Dom) Tanner is an igneous petrologist / geochemist at the University of Wollongong, New South Wales, Australia. Dom is interested in understanding the subvolcanic processes which concentrate precious metals in the Earth's crust. The Australia-New Zealand IODP Consortium (ANZIC) has enabled Dr Tanner’s participation in this adventure, which is supported through the Australian Research Council’s LIEF funding scheme [LE160100067].